The Sunday Drive is always in vogue in San Francisco and one favorite path is also sure to feed the ego. The famous crooked road of Lombard Street is elegantly paved in brick, set against pristine real estate, only has a speed limit of 5 mph to show off your Ferrari gloves and Porsche shades, and delivers plenty of eyeballs on either side of the steps. In high season, you can find over 300 cars an hour making those eight hairpin turns and motorists grinning every step of the way. And then there’s all the fanfare waiting for you at the finish line. It’s a colorful scene with cherry red sports cars set against blue and purple hydrangeas. And enough positive energy to surely inspire a second run down the scenic trail. March 11, 2013 in Attractions. Thanks Sharon! The guy in the Ferrari was adorable and I loved his wave. 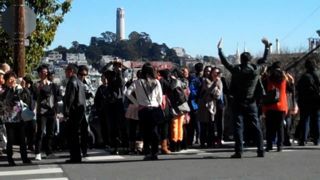 Easy to see how tourists become mesmerized, perhaps even hypnotized, by the uniqueness of our fair City.